Upper part of the arch of Janus at Rome, in which the same kind of masonry exists, but less regularly executed. Agonalia - a festival in honor of Janus celebrated in Rome on the 9th of January and the 21st of May. Janus is my favorite Roman god. Janus - an old Italian deity. He was represented with a face on the front and another on the back of his head. The month of January was sacred to him, as were all other beginnings. The myth makes him a king of Latium or Etruria, where he hospitably received Saturn when expelled by Jupiter from Crete. He had a small temple in the Forum, with two doors opposite to each other, which in time of war stood open and in time of peace were shut; the temple was trice closed on this account. With reference to his temple, the deity was called Janus Geminus or Janus Quirinus. In its over 800 year history, Rome was at peace only three times? I like Janus because he can see in front of him and he can see behind him--into the future and into the past? Also, I like to wonder whether Janus was "two faced" or was he schizophrenic? 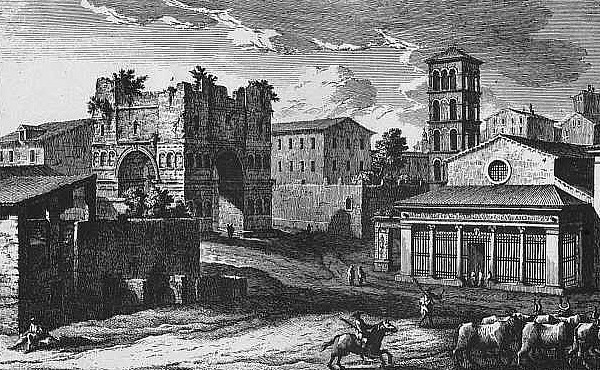 Within his large plan of the Campo Marzio, Piranesi applies the label "Circus Agonalis sive Alexandri" to the original Circus of Domitian which is today Rome's Piazza Navona. Albeit obscure information, Piranesi was indeed correct in his designation because the emperor Alexander Severus rebuilt the Circus of Domitian and renamed it in honor of Janus. It is fun to imagine all the big goings-on over 1700 years ago today within what is now the Piazza Navona. Constantine converted to Christianity the night before the Battle at the Milvian Bridge (October 28, 312) which lead into the City of Rome. He saw a vision of the (Christ) Cross in the sky, and hence ordered his troops to paint the (Christ) Cross on their shields. Constantine was victorious over the usurpative emperor Maxentius, and on October 29 entered Rome in triumph. Constantine's mother, St. Helena, is most known for having discovered the True Cross in Jerusalem (most recently dated c. 324-25). If you asked me, I'd say the "signs" surrounding this incredible mother-son team are still appearing. 1. The space created by the plan of the four-way Arch of Janus essentially forms a cross. 2. Only Helena is honored as a saint in the Roman Catholic Church, and her feast is celebrated the 18th of August. The Greek Orthodox Church, on the other hand (or is it other face? ), honors both Helena and Constantine as saints, and they share a combined feast day, which happens to be today, May 21st. The Arch of Janus Quadrifrons, Rome (c. A.D. 315), in the Forum Boarium, is another example of a four-way arch, but is of poor design. It has a simple cross-vault with embedded brick box-ribs at the groins, affording a further instance of the progressive character of Roman construction techniques: such ribs are possibly the prototypes of Gothic ribbed vaults. Fletcher is being a little two faced himself here--first the Arch of Janus is not good design, and then the arch is progressive construction! IANUS QUADRIFRONS: the name ordinarily given to a four-way arch of marble, which stands directly over the cloaca Maxima, and probably marked the line of separation between the forum Boarium and the Velabrum. It consists of four piers connected by quadripartite vaulting, and is 12 metres square and 16 high. The arches themselves are 10.60 metres high and 5.70 wide. Round all four sides run two rows of niches for statues, forty-eight in all, of which sixteen are unifnished. The keystones of the arches were sculptured, and the figures of Minerva and Roma are still visible on the north and east sides. The structure is of late date, third or fourth century, and may perhaps be identified with the arcus divi Constantini in Region XI. Hülsen points out that the superstructure, which was removed in 1827 as mediaeval, probably belonged to the attic; and reconstructs it with a pyramid on top. Samuel Ball Platner, A Topography and Monuments of Ancient Rome (Boston: Allyn and Bacon, 1904), p. 280. Likewise, on the Forum Boarium a huge tetrapylon, misnamed the Janus Quadrifrons, seems to have been built by Constantine. Richard Krautheimer, Three Christian Capitals: Topography and Politics (Berkeley: University if California Press, 1983), p. 26. A massive marble structure 16m. high, 12m. wide, the four-way arch stands with its piers astride the Great drain (Cloaca Maxima) which runs down the valley to the Tiber beside the Round Temple. Possibly an 'Arch of the Deified Constantine' which is listed in this area in the Regionary Catalogues, it must date from the early C4 AD (the quadripartite concrete vault over the crossing incorporates terracotta storage jars in a technique typical of the period) and probably replaced an earlier one on the same spot. It seems not to have been a triumphal arch but a Janus of the boundary marker type found in the Roman Forum (which may also have coincided with the Drain. Much of the marble shows signs of having been reused, but the rather rough appearance and squat proportions are misleading. The holes at every joint were made in the Middle Ages to extract the iron dowels which held the blocks together and all four facades have also been robbed of the small freestanding colonnades which projected in front of the niches on both levels. Whether the niches were intended to contain statues is uncertain but their semidomes are elegantly carved in the form of scallop shells. A figure of Minerva is carved on the keystone of the archway on the north side; Roma appears on the east. A doorway in the SE pier led up to a suite of chambers and corridors in the upper reaches; the arch must have had an attic storey, which some would restore as a pyramid but is more likely to have been rectangular, echoing the podium-like footings. A substantial superstructure in brick-faced concrete was removed in 1830 in the belief, perhaps mistaken, that it was the remnant of C13 fortifications by the Frangipane family. Amanda Claridge, Rome: An Oxford Archeological Guide (Oxford: Oxford University Press, 1998), p. 258. Today this building is identified as the Arcus Constantini, which Constantine's regional catalogues mention for Regio IX. It is a tetrapylon with four arched, and two passages which intersect in the form of a cross. This type of structure was known since the time of Augustus (Cavaillon), but equal importance was not given to all four sides until the Arch of Galerius was built in Thessaloniki in the period of the tetarchs. It was in that period that Constantine then assumed the dictatorship. Like the earlier examples, Janus Quadrifrons was probably topped by a superstructure, but this was removed in 1830 along with the medieval tower which the Frangipane family had placed on top. Janus is the Roman disignation for this structural type, and is at the same time the name of the god of routes and beginnings. 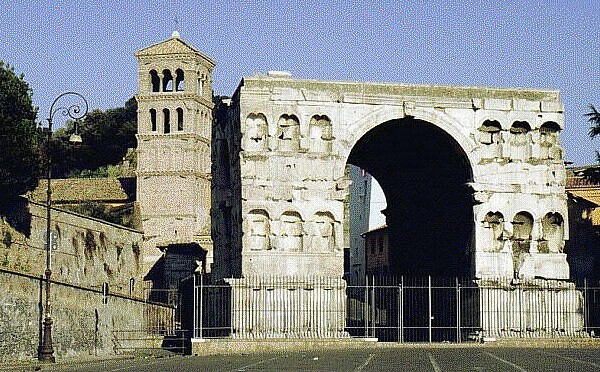 His shrine in the Forum Romanum consists of two passages which were opened in wartime and closed in peacetime. Constantine chose the point where two old routes intersected as the site for this structure. One of them ran from the veneable Forum Boarium to the Velabrum depression and thus to the political Forum Romanum. The Cloaca Maxima also followed this route. The second route, proceeding from north to south, was the trade route to which Rome owes its origin. There are two characteristic design principles, both of them in the Roman late-classical spirit: the building is subdivided by niches with shell-shaped vaults and, between the niches, by small columns (now lost) supported on corbels. These elements are placed so regularly and so close together that the impression of a glittering carpet is aroused, very much at variance with the weighty, cube-shaped mass of the building. A feature of similarily atectonis, late-classical design is the horizontal strips which line Janus Quadrifrons on all sides, even inthe passages, thus degrading him to a mere bearer of linear decoration. Stefan Grundmann, The Architecture of Rome (Stuttgart: Editions Axel Menges, 1998), p. 64. 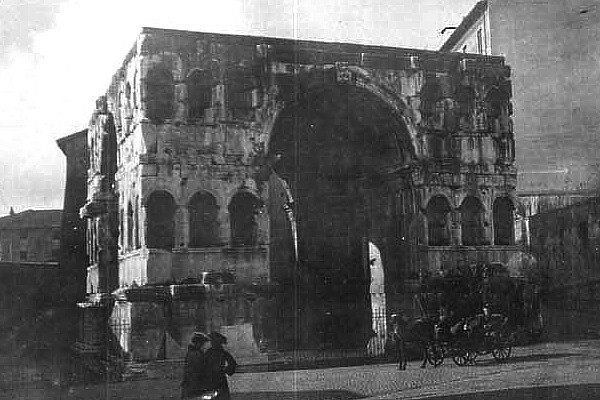 The Arch was built around 356 AD by Constans II in hounour of Constantine. The formal name was "Arcus Divi Constantini", Arch of the Devine Constatines. At that time Rome was no longer the capital of the empire, and the occation was a rare visit by Constans II to Rome. Janus was the divinity of arches, gates, doorways and bridges, but the present name is a later invention. The arch was transformed into a fortress in the Middel Ages by the Frangipane family, who built a tower on top of it. When this tower was removed in the 19th century, some ancient structures went with it. René Seindal, "Arch of Janus" (www: 2000.09.26). 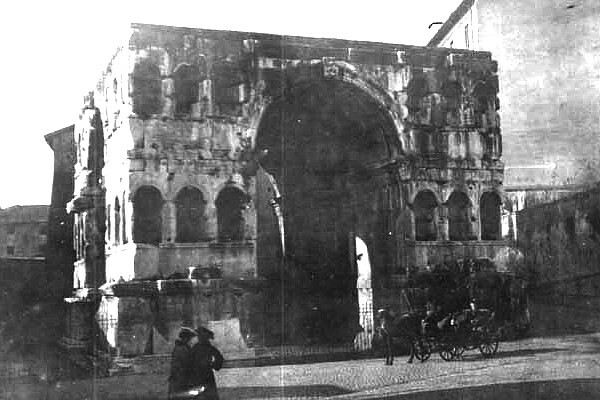 The Arch of Janus Quadrifrons, Rome, built in the Forum Boarium early in the fourth century, is a four-way arch at the junction of four roads. It is of debased work built about the time of Constantine, and has a simple cross vault with brick groins--probably a prototype of Gothic ribbed vaults. Banister Fletcher, A History of Architecture on the Comparative Method for Students, Craftsmen, and Amateurs (London: B. T. Batsford, Ltd., 1921), p. 174. The Arch of Janus Quadrifrons, Rome (c. A.D. 315), in the Forum Boarium, is another example of a four-way arch, but is of poor design. 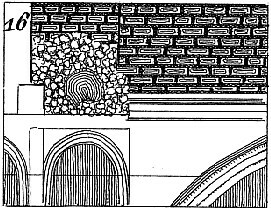 It has a simple cross-vault with embedded brick box-ribs at the groins, affording a further instance of the progressive character of Roman constructive techniques: such ribs are possibly the prototypes of Gothic ribbed vaults. Banister Fletcher, revised by J. C. Palmes, A History of Architecture (New York: Charles Scribner's Sons, 1975), p. 325. Earnest Nash, Pictorial Dictionary of Ancient Rome (New York: Fredrick A. Praeger, 1961), p. 504. * The year 1827 generally quoted by topographers, after Jordan, is erroneous. Giuseppe Vasi's mid-eighteenth century view of the Janus Quadrifrons depicts the tetrapylon with the ruined remains of a medieval superstructure. The Arch of Janus Quadrifrons as a hybrid late-classical/medieval building. Giovanni Battista Piranesi's mid-eighteenth century view of the Janus Quadrifrons depicts the tetrapylon with the ruined remains of a medieval superstructure. Piranesi also utilizes a reenactment of the Arch of Janus Quadrifrons as marker of the Triumphal Way's inversion from Pagan to Christian. a double arch of considerable magnitude, believed to be that of the four-headed Janus, the appearance of the structure involuntarily recalling the celebrated sanctuary of that god in the Forum, with which, however, it most not be confounded. There is no authority for calling it the Arch of Janus; we do not know what it was called by the Romans. In the sides of the piers which support the arch are twelve niches, apparently intended for the reception of statues. In one of these is a doorway leading up a narrow staircase to a chamber in the interior of the building, probably used as a place for business. This singular building, which in its present condition has a somewhat quaint appearance, has evidently been intended for a place of sale. Being erected over the spot where the two roads intersecting the cattle-market met, it seems to have marked the central point of the traffic carried on in this place. It is of white marble, old material re-used, and probably of the time of Constantine. Domitian erected several arches to Janus, but this is not good enough for his time. S. Russell Forbes, Rambles in Rome (Edinburgh: T. Nelson and Sons, 1882), p. 191. The god Janus was not four-headed, but rather had two faces, one facing forward and one facing backward. The designation 'quadrifrons' means four fronts. The reference to there being "no authority for calling it the Arch of Janus" relates to the notion that janus can merely mean a doorway, an opening, or a passage, and not necessarily a reference to the Roman deity. Janus an old Italian deity. He was represented with a face on the front and another on the back of his head. The month of January was sacred to him, as were all other beginnings. The myth makes him a king of Latium or Etruria, where he hospitably received Saturn when expelled by Jupiter from Crete. He had a small temple in the Forum, with two doors opposite to each other, which in time of war stood open and in time of peace were shut; the temple was twice closed on this account, in the time of Numa, and the first Punic war, and after the battle of Actium. With reference to his temple, the deity was called Janus Geminus or Janus Quirinus. The tetrapylon marks an intersection, and perhaps even provided shelter for business transactions. The structure comprises recycled marble, and, if the Arch of Janus is from the time of Constantine, the re-use of older marble for new construction would not be unprecedented -- the Arch of Constantine in Rome also comprises recycled marbles, most notable sculptural reliefs from the dismantled Arch of Trajan. William P. Thayer notes: It is attributed to a period a little before Diocletian in Zeitschrift für Geschichte der Architectur as against the attribution to the second third of the fourth century in Toebelmann. With the tetrapylon standing directly over Rome's main sewer (cloaca maxima), it not only marks the intersection of two streets but the underground axis of the main sewer as well. Even if the tetraplyon was not originally dedicated to the god Janus, it is nonetheless worth noting that the Pagan deities of Minerva and Roma inhabit key positions within the archway's design. 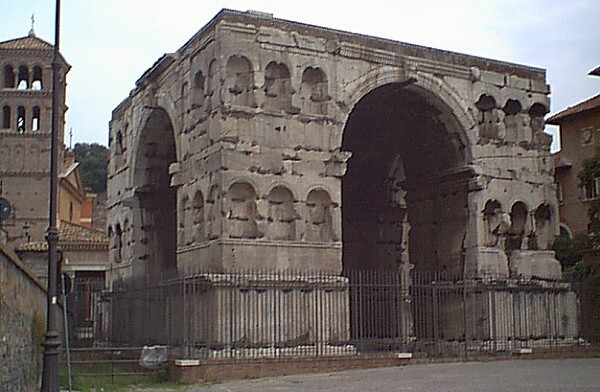 The presence of Pagan iconography may have some bearing upon whether this archway was designed and constructed under Constantine, the first Christian Roman emperor, however, it must be remembered that Constantine did not end Paganism, rather he made the tolerance of Christianity enforceable. Pagan iconography on coins minted throughout the reign of Constantine, for example, remained a staple. Hülsen's reconstruction of the Janus Quadrifrons recalls the "hybrid" building of the Hypnerotomachia Poliphili. Since the Hypnerotomachia Poliphili dates from 1499 and Hülsen's reconstruction dates from 1896, it may be worth speculating whether Hülsen drew inspiration from the Hypnerotomachian design. In any case, there is no physical evidence to confirm or even suggest that there once a pyramidal superstructure atop the Janus Quadrifrons. Although the tetrapylon plan of the Janus Quadrifrons appears symmetrical and identical on all four sides, there are nonetheless subtle differences between the sets of perpendicular sides: the archways are not of equal width, and not all of the niches are completely hollowed out on every side. If all the niches were completely hollowed out, then the niches of each corner would erode into each other. To remedy this problem, the designer of this tetrapylon introduced 'faux' niches into the above left and right faces of the archway's otherwise four identical facades. The fact that only thirty-two of the archway pier's forty-eight niches are completely hollowed out, while sixteen of the niches are shallow niche representations is not often, if ever, mentioned within the Janus Quadrifrons' descriptions.